With their first college semester behind them, Sidra Howard, Chasity Parker, Malajia Simmons, Alexandra Chisolm and Emily Harris return to Paradise Valley University with the hopes that this semester will come with less drama. Those hopes are shattered as the new semester’s events begin to unfold. The closer this group gets, the more they hang out. This takes money; money that Alex simply doesn’t have. Between trying to keep up with her friends financially, and maintaining her basic college expenses, Alex is desperate to make ends meet and for the first time in her life, she resents her situation. Tired of being criticized for missing out on all things fun, and hoping to avoid spending another semester break at home; Emily takes a chance and lies to her overprotective mother in order to get away for spring break. The consequences of her actions are more than she bargained for. The girls’ determination to keep Chasity from staying to herself this semester, is working on the loners’ last nerve. Trying to keep the intrusive group at arm’s length is proving to be just as difficult as trying to keep her growing attraction to Jason Adams from getting the best of her. It doesn’t help that the handsome football star makes no attempts at slowing down his pursuit of her. Already on edge; when the campus trouble maker Jackie Stevens makes it known that she has it out for her; Chasity, not being one to back down, feeds into the drama. Tensions between Chasity and Jackie come to a head and Sidra gets caught in a nasty crossfire. Enraged, a planned retaliation occurs, landing the girls in a situation that has the potential to ruin their lives. The girls realize that their second semester is proving to be a lot tougher than the first and if they ever want to finish out their freshman year; they must put aside petty differences and stick together more than ever. 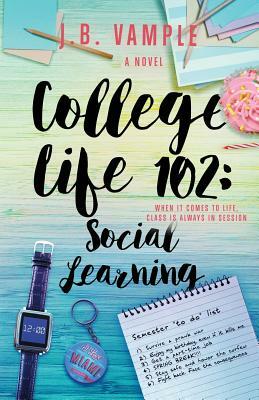 Tell us what do you think about College Life 102: Social Learning (The College Life Series, Vol 2).